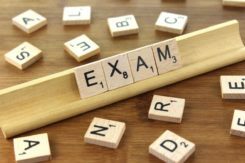 In this blog I am going to describe 5 tips for dealing with exam stress and a 6th tip if you are a parent reading this trying to help your child. The first thing to remember is that a certain amount of anxiety and stress in the lead up to exams is normal and necessary. Nature has designed us to feel anxious and stressed when faced with situations where we must perform because, if kept at the right level, anxiety motivates us to prepare and then enhances our performance on the day. A certain amount of anxiety is therefore vital if we are going to be able to do our best. However, too much anxiety leads to unnecessary distress and discomfort and can hinder our performance. There is no doubt that good exam results mean more options will be open to you. However, they do not guarantee a happy, healthy and fulfilling life. It is therefore important that you keep the importance of your academic achievements balanced in your mind with other things that will bring you happiness and satisfaction; friends, family, hobbies and health. It is the healthy postman vs the miserable brain surgeon dilemma. Your exams are important but they are not the only thing of importance in your life, holding onto this will help to keep your anxiety at a level where it helps rather than hinders you. This might seem like an obvious one but start your revision sooner rather than later because revising little and often is a much more effective way to learn and retain information. Cramming at the last minute is not only very stressful but it isn’t a very effective way of laying down the information in your mind that you will need in the exam. This approach will keep your anxiety at a low, steady and manageable level rather than you experiencing an overwhelming burst of stress in the last few days. Finally, a slow and steady approach to revision will mean you feel in control and on top of your work and refreshed and ready to tackle the exam itself. Make sure that your revision timetable allows you to alternate between revising and relaxing. You should revise for no more than 45 minutes at a time before taking a break. Also, scatter plenty of relaxing and enjoyable activities throughout the days and weeks leading up to your exams, this will ensure that you are refreshed and ready to get the most out of each revision session. This ties in with what I talked about in Tip 1, balancing what you SHOULD do with what you WANT to do will help to keep your anxiety at a healthy and helpful level. When we are under pressure we tend to make the worst case scenario our reality, psychologists call this catastrophic thinking, for example, “I am going to fail all my exams and my life will be over”. If you are feeling very stressed try and work out what you are thinking, write it down and then assess how accurate your thought is by looking at the evidence that supports it and the evidence that does not. If you are feeling very anxious this can be hard to do, especially finding the evidence that doesn’t support your thought, so it is worth getting someone who is not about to sit an exam and is feeling a bit calmer to help you. Use the evidence you collect to put together a more accurate thought, write this down and read it regularly, this will help you to feel calmer and more confident which will in turn reduce your stress levels. If you are feeling like you just can’t cope speak to your teacher. Teachers help pupils get through exams every single year and so they have lots of experience and knowledge about how to survive this difficult time. And remember, you are finding this difficult because it is difficult! If you are a parent reading this, your attitude, especially your confidence in your child’s ability to do their best and that together you can work out a way forward whatever happens, will be incredibly important in determining how your child deals with their exams. To make sure you are in the best place that you can be to offer the support that they need, make sure you deal with any issues the exams bring up for you (e.g. your past experiences and worries about the future), so that you are clear and free of any baggage that might add fuel to the ‘exam stress’ fire.